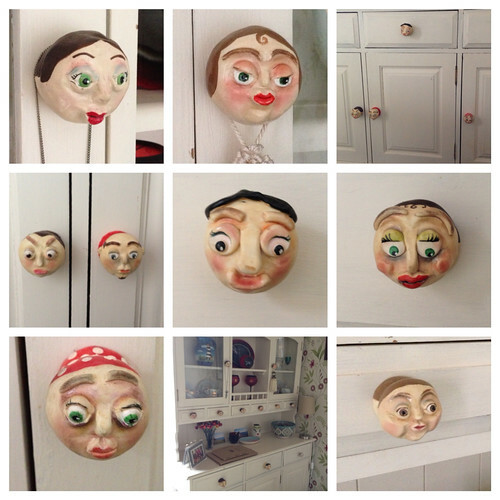 I was reminded today, by a post on a forum, of the door knobs I made for the dresser in the dining room. They must be two years or so old now and are holding up really well, so now I've found all the clay tools for the doll I made today I think I'll make the set we need for the wardrobe in the main bedroom. 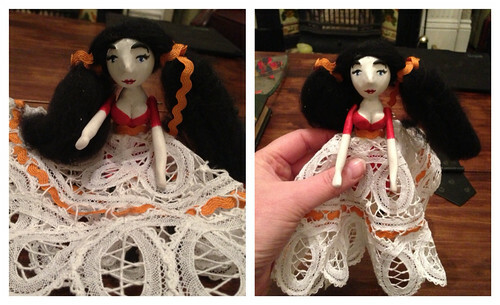 Earlier this year, I made my first attempt at making a doll using some form of sketch or design before I started. I’ve finished the knobs for the dining room dresser. Well, I needed to do something about the road kill doll, so after an email conversation with a friend, I came up with the idea of using shrink plastic. I made this heart on clear Shrinkle paper – I’d forgotten how much fun it is to see it shrivel up, fold up horribly, and then finally flop flat – so much smaller than the original size. I want to be a dollmaker. I want to make art dolls. I really, really do. Or maybe a ceramicist making little people from clay, but I thinks that’s a similar thing really. I just want to make art people. Of every craft I look at, this is the thing that drags me back time and time again. I want to be able to create characters: striking little people with a whole story to tell from their clothes, their expressions, their postures. I want to create a life I don’t lead – and don’t want to lead – through my people: ethereal girls with floating dresses and flowers in their hair, sinister dark haired men with a glint in their eyes, slim waisted woman wearing layers and layers of decorative fabrics. How wonderful to be create character after character, to create a whole world if you fancy. And unlike a novel, there’s no need for a beginning and an end. No need for the timing and pacing of a plot. You can create something that speaks for itself. Fantastic. Now, the last thing I need is another hobby. I already don’t have time to do the stuff I do: the drawing, the clay people, the polymer dolls, the paper mache. But then, as the lovely M says, I really have only one hobby and that is ‘creating’. I might cycle through the things I want to create and through the media I choose – photography, clay, sewing, pencil, paint – but I’m still just creating. I love it. It’s not even that I’m good at it (yet) – I rarely produce anything that lives up to the picture in my head. But I love creating things and I love thinking about creating things. In fact, in many ways I love thinking about creating things even more than I do actually creating them. In this way I am like my mum. One of the things that made me feel very sad when she died was that she never created the things that she would so often talk about. But as I’ve grown older I’ve understood how much pleasure there is in thinking up the ideas for a project & planning what it might look like, and how this can sometimes be even better than the frustration of making it happen. And I realise that I often do exactly the same. I love to dream about what I might make one day. I love to buy books and surf the web, and look at what I could do, one day, when I have the time. I love to gather ideas. I love to see what else people create and the utter range of skills and talent out there. I’m blown away by it. This morning, I received in the post a copy of ‘Introduction to Cloth Dolls’ by Jan Horrox. Wow! I’m blown away. I love the creations in that book, and with what seems like clear step by step instructions. Her dolls are very striking and full of character. It’s a long time since I’ve sewn in earnest, but I’m very, very inspired. Will I ever make one? Possibly. Probably. But in the meantime I can dream and think. And plan. And dream about the day I can put a sign outside my house saying ‘Hill and a Tree. Art doll maker’…. Drum roll…. I’d like to present: Monsieur Legume, my very first primitive polymer clay doll! He’s very loosely based on Nancye William’s tutorial for primitive folk dolls but he just started to emerge so I let him. I’m pleased I did. I like him. He’s so flawed but he’s kind of endearing all the same. I had so much fun making him. I had to make bent limbs rather than straight as they wouldn’t fit into the baking tin I was using, but I like that. And then I overcooked the clay and it turned quite brown, but that didn’t matter too much as he was always going to be painted. The black was originally just an undercoat for a more exciting colour but I think I like him just the way he is. One of my ongoing projects is to make a set of polymer clay knobs for our welsh dresser in the dining room. It’s a great thing to do because a knob can be made whenever there is some free time and there’s not too much pressure. Other than the fact we have a dresser that is difficult to use because it’s only got a few knobs. The others got lost when I took them off to paint it white. Sigh. Any way, I’m now more than half way through so it seemed a good time to share the knobs so far. Apologies for the poor quality of the photos. I’ll take fantastic shots when the remaining knobs have been made.